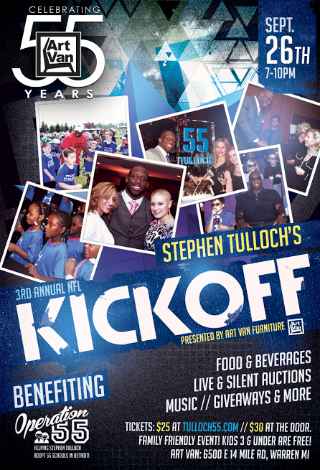 On Friday, September 26, 2014, Detroit Lions starting middle linebacker Stephen Tulloch will host his 3rd Annual NFL Kickoff event at Art Van Furniture in Warren, MI (4500 14 Mile Rd, Warren MI) from 7-10pm. The event will raise funds for the Stephen Tulloch Foundation and Operation 55 that is currently adopting 55 schools throughout the Detroit Public School system providing new technology, books, necessities and fulfilling wish lists sent to the foundation through school teachers, principals and administration. Tickets are $25 and will feature complimentary food, drinks, door prizes, a silent auction and live auction. Operation 55 was launched in 2011 when Tulloch signed with the Detroit Lions. The purpose of the program is to help as many people as possible and give children throughout the Metro Detroit area opportunities to come to Detroit Lions home games to experience a game day with Tulloch, paying bills for those in need, assisting schools with necessary tools and helping families across the state. Stephen has taken over 1500 kids from various organizations throughout Detroit, including The Jalen Rose Leadership Academy, Big Family, Angels of Hope and more, to home Detroit Lions games since he became a Detroit Lion. Tulloch also provided over 155 kids with free dental services, and adopted families in Detroit for the holidays providing them with food, clothing and toys. In 2014, Tulloch will continue the current outreach efforts as well as select 55 schools to support and improve in Detroit. Tickets are available online at www.Tulloch55.com for $25 and can also be purchased at the door (pending capacity). Last year, the event raised over $25,000 for Tulloch’s Operation 55 Program, which helps fund Operation 55. Art Van Furniture is the Midwest's largest furniture retailer and America's largest independent furniture retailer. The company operates 37 stores throughout Michigan, six stores in Chicagoland, one store in Toledo, Ohio, one store in Fort Wayne, a full service e-commerce website, plus 38 freestanding Art Van PureSleep bedding stores in Michigan and Ohio. Founded in 1959, the company is family-owned and headquartered in Warren, Michigan. Visit artvan.com for more information.